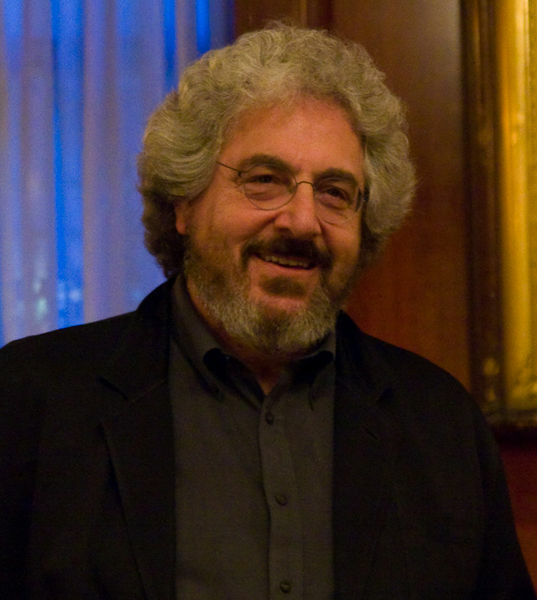 On February 24th, 2014, comedy writing, acting, and directing legend Harold Ramis passed away of complications with autoimmune inflammatory vasculitis. It was truly a sad day to lose such a wonderful man and one hell of a talented individual. Most people remember Ramis as the nerdy and eccentric Doctor Egon Spengler in the cult classic comedy Ghostbusters. But that is just the tip of the iceberg when it comes to this man’s legacy. Ramis’s work goes far beyond just that title role. In fact, what many people may or may not know is that most of the cult classic comedies of the 1980’s and into the 90’s can be attributed to either Ramis’s directing, producing, and/or writing. I thought it was time to pay tribute to a great talent by giving a list of the Top 5 Best Movies Written by Harold Ramis. Please keep in mind that A) this list is to commemorate Ramis and his contributions to the film industry and B) that this is my own list and my own opinion. If you have a different opinion then please comment, send me a message, or make your own list and send me the link. I would love to see them. With that being said, let’s get started with an honorable mention. 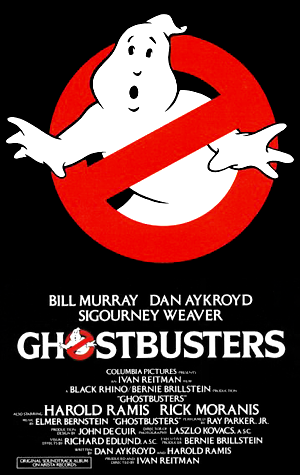 Written along side Dan Goldberg and Len Blum, the honorable mention goes to one of the many collaborations between Ramis, actor Bill Murray, and director Ivan Reitman. The comedic military movie starring Murray and Ramis is about a down on his luck man convinces his buddy to join him in signing up for the military is a staple of early 1980’s comedy. This also marks Ramis’s first acting role in a major motion picture. It only misses the list because the other five are timeless classics. The simple fact is that a lot of the movies on this list are going to feature the same people. This is another movie written by Ramis, Blum, and Goldberg, directed by Reitman, and starring Bill Murray. I suppose when you have a team that can mesh together so well, you just roll with it as people who would draw influence from Ramis would show in the future (i.e The Farrelly Brothers and Adam Sandler). Meatballs was the fun teenage/child coming of age movie before John Hughes made it cool. It might not be much of the trend anymore, but several years back, people didn’t just go to summer camp for a week or two, they spent their entire summers there. Meatballs was one of the first movies that took all the crazy antics and fun of the summer camp experience and put it all in a comedy classic. For anyone who was a child near the late 70’s and early 80’s, this is a staple of their childhoods. At number 4 we have the first film on this list that was not only written (along with Danny Rubin) but also produced and directed by Ramis and it just so happens that this movie is often listed as one of the greatest comedic films ever made. 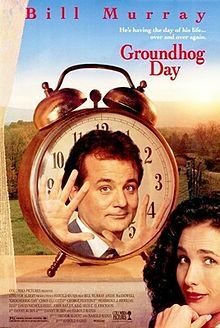 Not only a hilarious film, but a very cerebral and thought-provoking film, Groundhog Day has become synonymous with the ideas of self-improvement and has even become a favorite among Buddhists. Unlike the other three movies on this list, I was unable to see Groundhog Day until just recently so it doesn’t have that nostalgic feel the other three will soon have. But needless to say, the legacy that this film left is enough to end up on any list of greatest movies written by Harold Ramis. The day that I heard of Harold Ramis’s passing, the first thing I did was go onto Netflix and watch the first Ramis movie I ever saw, Ghostbusters. Even before I knew of Harold Ramis as an actor and all his contributions to the film industry, I knew of Egon Spengler. The adventures of Venkman, Spengler, Stantz, and Zeddamore is some of my favorite ways to pass the time when I just need a good laugh. Ghostbusters was one of the first movies my parents ever showed me and it will always have a special place in my heart. It is one that will never get old no matter how many times I see it and the feeling is shared with millions of other. It is a timeless classic and it truly says something about Ramis as a person when a movie as timeless as Ghostbusters is only third on the list. While most of these movies are often considered to be one of the greatest comedies of all time, National Lampoon’s Animal House is often considered to be THE greatest comedy of all time. 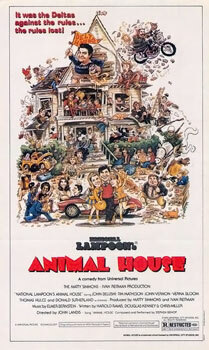 One of Ramis’s earliest movie writing roles, written along side Douglas Kenney and Chris Miller, Animal House is a staple of classic cult comedy. It influences countless television show episodes, college comedy movies, and has spread its influence to just about every aspect of the comedy genre that you can imagine. While I would argue that Animal House is the greatest of the movies on this list, it is still overshadowed on the terms of Ramis’s career by a movie written by him and it also happened to be the first movie that he directed. How could it be anything else? 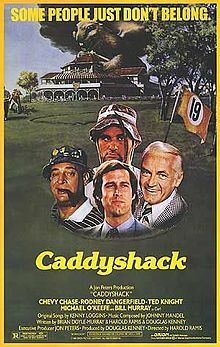 Caddyshack is the textbook example of a perfect movie. It is that perfect storm of all things amazing, the cast is correct, the writing is spot on, the direction is perfect, the chemistry is there, you can feel the love, and the excitement that is put into the movie. It has everything that you could want in a movie and more. Caddyshack is often considered one of the greatest comedies of all time as well as one of the greatest movies based on sports of all time. Written and direted by Ramis, this is one of those movies that just hits it out of the park and will stand as the golden goose in the already sparking Harold Ramis oeuvre. With that, my nod to Harold Ramis and everything that he has done in his career comes to a close, farewell and god speed. To everyone else, thank you for reading. As always, if you enjoyed this review then please like and subscribe for more from me. Due to the busy schedule of my co host Brandon Lias, there will be no NTOE this week. But I will have a new review up on Thursday for everyone to look forward to!